ALUMINUM COLLAPSIBLE SHOVEL: Our collapsible aluminum shovel is the ideal snow shovel for your car, SUV, RV, or snowmobile, and this lightweight snow shovel breaks down into three pieces for easy storage and is the ideal car safety accessory to go along with your road emergency kit. MULTI PURPOSE SHOVEL: The compact size and light weight of this aluminum sport utility shovel makes it the ideal camping shovel or backpacking shovel, and should be on everyone's list of essential backpacking or camping accessories, as the applications are endless. WINTER PREPARATION: Weather can be unpredictable, and everyone has ice scrapers and snow brushes in their cars, don't be caught unprepared for when you might need to dig out your car after that winter snow storm, add a Lifeline Aluminum Shovel to your list of winter weather driving preparation accessories. PERFECT SIZE AND WEIGHT: Our shovel adjust from 26" to 32" to give you the best leverage when using our metal shovel depending on your needs. 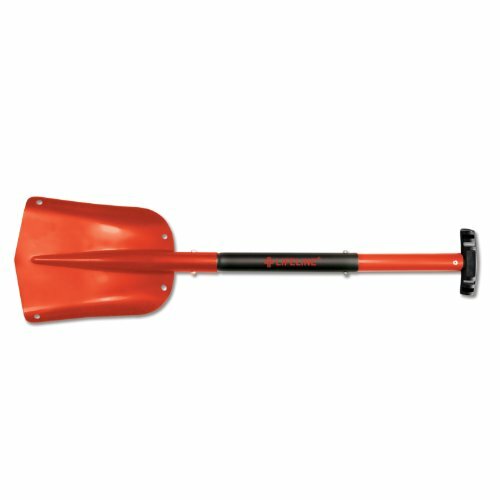 Weight just 1.6 pounds, makes our sport shovel easy to use for all, regardless of size and strength, and easily packs away when not needed. QUALITY PRODUCTS: Unlike other knock off brands, when you buy Lifeline product you know you are getting quality. As an ISO certified company, all of our products undergo stringent quality control processes, and this shovel is no exception. Don't take a chance on cheaper alternatives that cut corners and may fail you when you need them most. If you have any questions about this product by Lifeline, contact us by completing and submitting the form below. If you are looking for a specif part number, please include it with your message.